It's a dark and stormy... week. Lights are on, wellies are deployed, and I have a new pack of vanilla tealights, but my favorite way to be cozy when it's dreary outside is baking. A couple of our friends have apple trees in their gardens so the first round was several apple crisps. (After the apples were gone I was introduced to Swedish apple cake/pie so I still need to explore that). 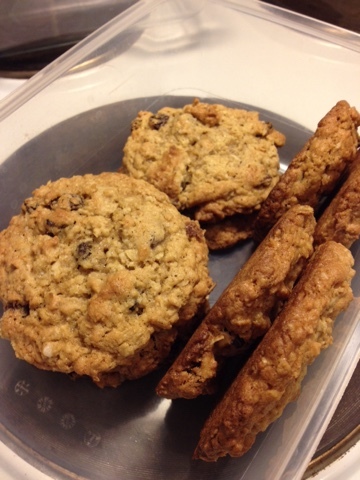 Then I got on an oatmeal raisin cookies kick because the Swedish bakery style of making cookies is flat and crispy, and that doesn't really do it for me. I love this recipe because it makes a chewy cookie that stays soft, and there are chunks of kosher salt to cut the sweetness. At any given time you can find chocolate chip or oatmeal cookie dough balls in my freezer for an unexpected fika or, more likely, when I need to sneak into the kitchen and have a moment. I have managed to find most of the baking ingredients I use, with names like bikarbonat, ingefära, and florsocker. Actually, you are probably not surprised to learn that food is the category in which I have learned the most Swedish words. Canned pumpkin is available here, but it's expensive and only at certain stores, so I'm skipping the pumpkin section of my fall baking routine. The next thing I traditionally make involves molasses. It feels like I may have seen a bottle of Brer Rabbit at a specialty store, but that may have been before we moved and I didn't feel like slogging through the rain all over town to find out. Fortunately I came across this bottle, nestled amongst the sugars and syrups at my usual grocery store. 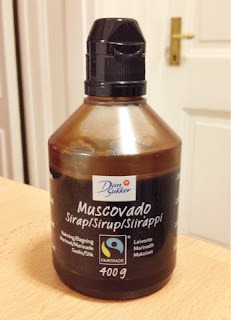 I have heard of muscovado sugar, but I wasn't sure what it was. The ingredients list was beyond my level of Swedish, but "muscovado" is also their word for brown sugar here, and the sugar trade (and refining process) is something I actually remember from American history class. Molasses is what they remove from brown sugar to make it white. So I went for it. Taste? Check. And the most important test: it makes a great batch of Ginger Chews. 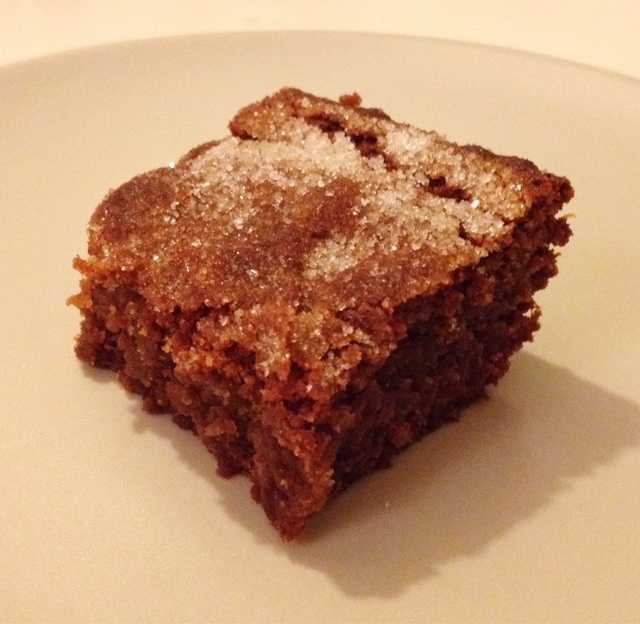 They're the consistency of brownies with the flavor of gingerbread. 2. In a large bowl, cream together the margarine and 1 cup sugar until light and fluffy. Beat in the egg, then stir in the water and molasses. Gradually stir the sifted ingredients into the molasses mixture. Press the dough into a buttered 8" or 9" square pan and sprinkle with the remaining 2 tablespoons of sugar. 3. Bake for 28-30 minutes, or until center is set. Allow to cool completely before cutting into 2" squares. Thank you for the reminder of this recipe!!! I might have to make a batch this weekend. Yum!!! I love living vicariously through your blog. It looks like a great time, although I'm sure it isn't always easy. We miss you at our Pinterest parties and look forward to maybe stealing you for an evening when you visit the states. I would love to be stolen! I miss being with my Pinterest girls. Thank you, Mandy, for your hand in this recipe. You were the one who told me about the Big Soft Ginger Cookies, on which this recipe is based. Hugs from Sweden!